So I’m now two episodes into the era of Unbelivably Grumpy Scottish Doctor and I’m having an awful lot of fun. Capaldi’s an effortlessly great actor and he’s already starting to find lots of nuances and interesting corners to his version of the Doctor. Even better, at this point in the season, there’s a real sense of everything having a Point. The entire performance feels in gear, like it’s driving the show and that’s given it a very different energy. It’s weird and chewy and difficult and I’m really enjoying how much of it there is to digest and examine. And that brings us to Danny Pink. Danny was introduced in ‘Into the Dalek’, the episode that ran on the 30th of August. As I write this he’s only been around for that episode but the more I think about, the more I think he’s not only the most interesting male character on the show right now, he may be the most interesting male character the show has featured since it’s return. The biggest reason for that is apparent from the first time we see him on screen. 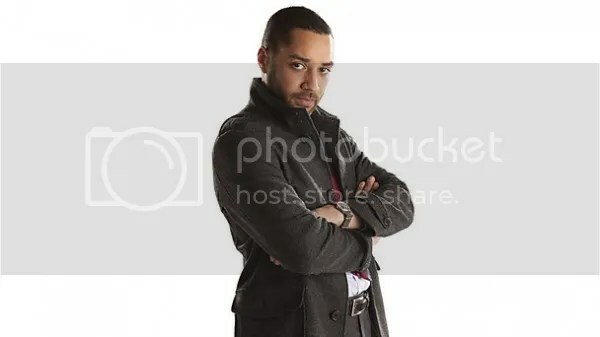 Samuel Anderson’s a big guy and has real physical presence, but as Danny he uses it as an absolute last resort. Even in the first scene, when he’s running the cadet force, Anderson’s physical performance is subtle and nuanced, showing us Danny’s simultaneously finding comfort and restriction in military posture. Then you see him in the classroom and it becomes even clearer. He hunches, hides his height and mass as much as possible. It’s an interesting trick I’ve seen a lot of physically large actors use, in particular Jared Padalecki and Tahmoh Penikett. It’s also something I’ve done; big guys carry trauma in their shoulders and their upper back and it changes how they stand. You hunch a little, try and present a smaller profile. If you stand up straight you’re a target, if you crouch over you could be a survivor. That posture is the physical mark of psychological trauma and the show makes that explicit in two ways; one slightly cackhanded, one very well observed. The slightly cackhanded one is when a boy in Danny’s class asks whether he’s killed anybody. It feels a little rushed, especially the fact that the kid pushes the issue but it leads to something incredibly brave; Danny locks up for a few seconds, cries and then gets himself together and dismisses the class. Superficially it’s a mildly overwrought character beat in a show that, especially in the Tennant era, pushed the emotional response button so hard the casing broke. Look deeper though and this is brave in two or three different ways. This is the first appearance of the character and suddenly we’re off the edge of his comfort zone, putting incredible pressure on Anderson as an actor. Secondly, it’s one of the most honest, and convincing, portrayals of trauma I’ve seen on a drama series and thirdly, everyone’s terribly British about it. It’s so polite, and well observed and painful as Danny assumes the kid has spread it round the school, Clara puts her foot in it and they’re both terribly polite and awful at talking about things at each other. It’s messy and scrappy and exactly the sort of response you see in the real world. Combined with the total emotional vulnerability, and the nice line in self-deprecating humour, it sets up Danny up as a troubled, thoroughly decent and grounded character. It manages this in, optimistically, ten minutes of screen time. All of this makes Danny interesting, but comparing him to his predecessors makes him fascinating. Captain Jack is a gloriously exuberant, basically immortal adventurer. Rory is a formerly immortal, and wax, male nurse with centuries of experience who is prepared to do anything to defend his family. Danny Pink is a former soldier turned teacher. More importantly, he’s both more defined, and more damaged, than either of his predecessors. He’s defined by the fact he has a clear life outside the Doctor’s. He’s damaged because he’s bent double under the weight of something that is either PTSD or so close to it as to make no difference. He was described, astutely, by Dan Wickline, as ‘a companion’s companion’ and that’s exactly the roll he fills. Danny is a normal person who is loosely connected to the insanity of Clara and the Doctor’s life. That in turn puts the show in a very different, more realistic context than it’s had for a few years. It’s a little like having a season of Waterloo Road where one of the teachers occasionally pops off into time with her grumpy pseudo-friend. The fantastic feels more fantastic, the normal feels more normal and both build the other up. It’s very early days with Danny yet and there’s no way to predict exactly who, or perhaps what, he is. So far I’ve heard everything from the Master to a refugee from the future to a former UNIT soldier. They’re all plausible, and I’ll even list the fun ones in a later post. But if he does have an epic destiny, I can’t help but worry it’ll be disappointing. Because, right now, Danny Pink is a damaged, flawed, ordinary man. And that means that right now, Danny Pink is extraordinary.